... but please don't get me wrong. I'm not complaining! Cos I'm just plain busy lately... with bucket-loads of Christmas baking and gift wrapping. Besides, the end of the year is usually crazy at work for me rushing to conclude all that I have done for 2016 before heading to put my feet up for the coming summer break. Gosh! I need a break so badly. Although I'm not complaining, I can't exactly say that I have been surviving this crazy season very well this year. Due to fatigue, I have been down with allergies and strange multiple mild fever lately and can't really do much for blogging and social media these days. Why these chocolate cream sandwich cookies??? "Mum, I want you to bake this!" said my son while pointing to this recipe when we were browsing some really old issues of food magazines. "I know. 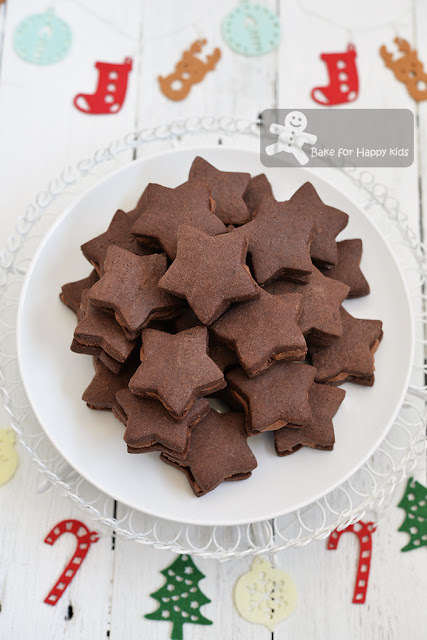 I will bake these cookies in star shapes for Christmas." And so I did. 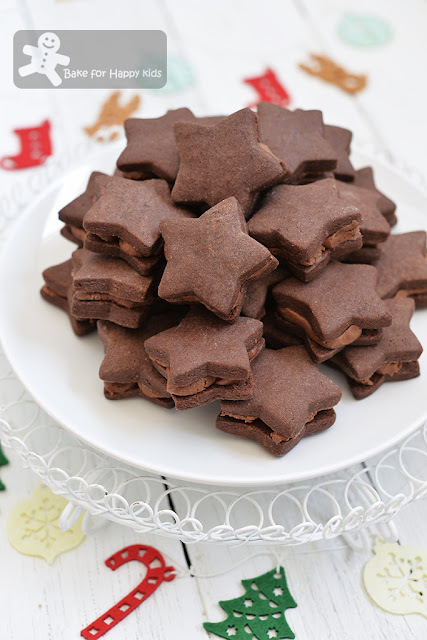 I have baked these Christmas chocolate Cream Sandwich Cookies for my son's friends. Despite of my lack of time and fatigue, I have managed to bake these cookies with no worries... keke! Maybe because I'm an iron woman or something... LOL! Nah!!! The truth is this recipe is really fantastic... Fantastic in the way that both the chocolate cookies and chocolate cream are really easy to handle at all times even before and after baking and assembly. I have to make sure that the cookies are good enough to give. Watch how I baked these chocolaty cookies in my one-minute video. Although baking these cookies is little time-consuming, the steps are actually really really really easy! So this is it! This is my last blog for 2016. I have published a total of 110 blog posts this year. I must say that these recipes are really really really good as I have well and truly tried, tested and tasted them. Hope that you will like my blog and "like" me too at my Facebook at here. If you like my recipes and want more in the future, you can get the latest updates by following me at either my Facebook at here or here or my Instagram @zoebakeforhappykids. Cheers! 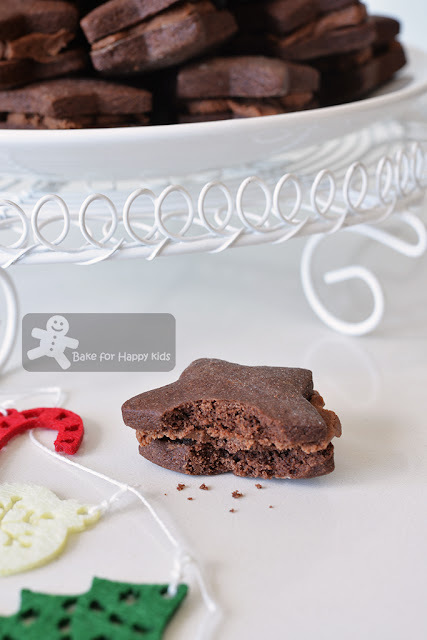 *I have baking for these cookies for little kids and so I choose to dark chocolate with 40% cocoa. You can use dark chocolate with 70% cocoa if you like your cookies to be more chocolaty and bitter-sweet. Combine flour, cocoa powder, baking powder and salt in a bowl. Using an electric mixer with paddle attachment, beat 120g butter and caster sugar with medium speed until light and fluffy, about 3-5 mins. Beat in egg gradually and vanilla until combined. Sift flour mixture into the butter mixture and use a spatula to mix until the flour mixture is just incorporated. Place cookie dough in cling wrap. Wrap and refrigerate until firm, at least 1 hour. Working quickly to keep the dough firm and chilled, roll dough on a lightly floured surface into a flat shape with 3mm thickness. Using a cookie cutter, cut cookies into any shapes that you like. Arrange the cut cookie dough in the prepared trays with about 2 cm / 1 inches apart. Bake for 12 mins until cookies are firm. Allow cookies to cool slightly in the baking trays for about 10 mins. Transfer cookies onto a wire rack to cool completely. Place chocolate into a heat proof bowl. Using a microwave or a double boiler, melt and stir chocolate until smooth. Allow chocolate to cool slightly, about 10 mins. Use a spatula to combine chocolate and butter in a large mixing bowl. Sift in icing sugar. Mix until well combined. Allow cream to rest at room temperature for about 15 mins to become slightly firm. To assemble, spread or pipe a dollop of cream in between two cookies. Hi Zoe! You deserve many stars for your efforts and achievements! Hope that you get some well deserved rest and see you next year :) Meanwhile wishing you and your family Merry Christmas and a Happy New Year! Just want to say..all the very best..for Christmas..and 2017. Oh my these look FABULOUS! I love love cream sandwiches or jam biscuits! This is such a great recipe Zoe! Have fun with christmas this year!